Getting married is the easy part. Making it work is the hard one. Once a Muslim man and Muslim woman get married they must try their utmost to make their marriage happy and peaceful. And this trying should come with both sides. Ofcourse, a happy marriage does not mean a perfect marriage because there is no such thing as perfection in this world. When 2 different people with different brought-ups and different personalities come together and live together there are bound to be disagreements but they must weather the storm and come out strong. One of the most important thing that Allah has advised us to bring into our Muslim marriages is the demonstration of love. Show you love your spouse ALL the time (yes, even when you don’t feel like it!). 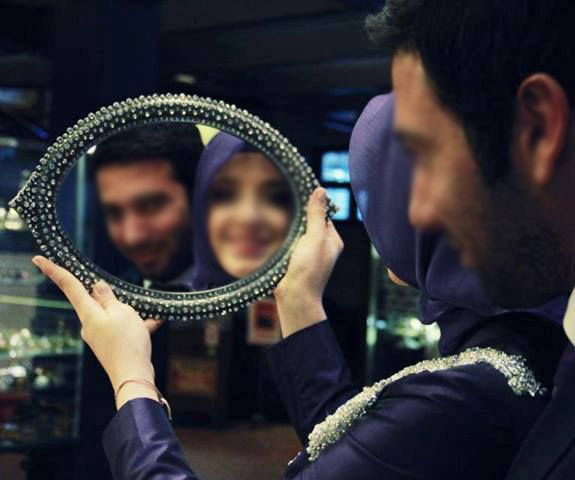 display of love goes a long way in making marriages healthy despite the disagreements a Muslim husband and wife face. One of the most important way to display love and affection to your spouses is to kiss and hug them whenever you get a chance. The Prophet Mohammad (PBUH) used to kiss and hug his wives whenever he left the house and when he came back. Those kisses were not out of desire but because of affection for them. It was just a small gesture but the happiness it brought in the heart of the wives worked a long way to keep the Marriage healthy and amazing. And so we must ensure that we do not shy away from displaying our love for our spouse. Allah has made them halal for us and us halal for them then why must we shy away? Allah has said in the Quran that they are our garments and we are their garments. This covers all the depth of the relationship including respecting each other, protecting each other and loving each other. So go ahead and hold your husband’s hand and go ahead and plant a small peck on your wife’s cheek. Theire tiny acts but they’re stronger than iron to secure your marriage. Make it work. Don’t shy away. Show your love.